I try to minimize my usage of paper towels, and only buy recycled. 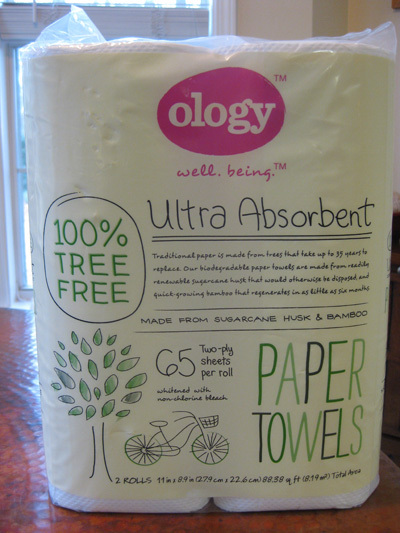 This week, I wanted to opt out of tree-made towels altogether, so I tried my first treeless paper towels from ology by Walgreens. And I love them. Not only are they softer than most recycled paper towels, but they are also very absorbent. So, if they aren’t made of trees, then what’s inside? Bamboo and sugarcane husk! The sugarcane husk would have been otherwise disposed of, and the bamboo is very renewable (ie, much easier to replace than a tree). What a lovely idea. I must say, I didn’t have high hopes for these treeless paper towels, but I found them to be better than regular paper towels. Plus, the ology paper towels are whitened with a non-chlorine based bleach. However, they are made in China. I paid less than $4 for a two-pack of these treeless paper towels at Walgreens. Have you tried ology paper towels? Hey, this is a useful post for me! I was looking at these very towels the other night at Walgreen’s in Oakland, Calif. and wondering about them… thx. That’s great to hear! I also just bought a roll of the ology toilet paper that I’m going to review.